Your average spam email can contain a great deal of information about the systems used to blast junk email. If you’re lucky, it may even offer insight into the organization that owns the networked resources (computers, mobile devices) which have been hacked for use in sending or relaying junk messages. Earlier this month, anti-spam activist and expert Ron Guilmette found himself poring over the “headers” for a spam message that set off a curious alert. “Headers” are the usually unseen addressing and routing details that accompany each message. They’re generally unseen because they’re hidden unless you know how and where to look for them. Gtacs.com belongs to the Trace Systems GTACS Team Portal, a Web site explaining that GTACS is part of the Trace Systems Team, which contracts to provide “a full range of tactical communications systems, systems engineering, integration, installation and technical support services to the Department of Defense (DoD), Department of Homeland Security (DHS), and Intelligence Community customers.” The company lists some of its customers here. 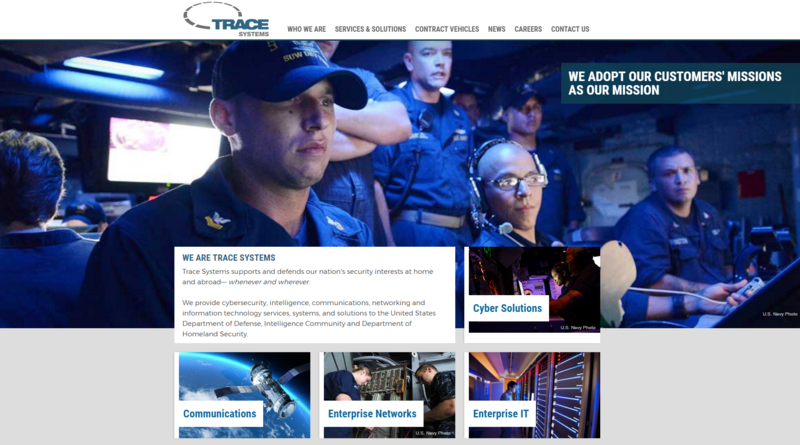 The home page of Trace Systems. Passive domain name system (DNS) records maintained by Farsight Security for the Internet address listed in the spam headers — 72.52.186.80 — show that gtacs.com was at one time on that same Internet address along with many domains and subdomains associated with Trace Systems. It is true that some of an email’s header information can be forged. For example, spammers and their tools can falsify the email address in the “from:” line of the message, as well as in the “reply-to:” portion of the missive. But neither appears to have been forged in this particular piece of pharmacy spam. Updated | He has been the forgotten man in the West’s desperate campaign to obliterate the Islamic State militant group (ISIS). He didn’t even merit a cameo in the celebratory coverage of Osama bin Laden’s death at the hands of U.S. Navy SEALs in 2011. For several years, he has been described as the leader of a spent force. Yet Ayman al-Zawahiri, bin Laden’s mentor and successor, remains a key player in an attack threat to America that retired Marine Corps General John Kelly, the U.S. homeland security secretary, says is "worse today than what we experienced 16 years ago on 9/11.” And if officials in the Donald Trump administration have their way, al-Zawahiri’s name will soon be as familiar to the world as bin Laden’s once was. Karachi would be a “very hard” place for the U.S. to conduct the kind of commando raid that got bin Laden on May 2, 2011, Riedel says. The heavily policed city, the site of a major nuclear complex, also hosts Pakistani naval and air bases, where forces could quickly be scrambled to intercept American raiders. Plus, bin Laden, al-Zawahiri’s late protégé, remains a popular figure among Karachi’s millions of poor, devout Muslims, who could well emerge from their homes and shops to pin down the Americans. The Al-Qaeda leader had been moving about the Federally Administered Tribal Areas since at least 2005, according to a forthcoming book, The Exile: The Stunning Inside Story of Osama bin Laden and Al Qaeda in Flight, by longtime British investigative reporters Cathy Scott-Clark and Adrian Levy. “Married to a local Pashtun girl, [al-Zawahiri] had been given a new home, a large mud-brick compound up in the hills” in Damadola, they write. In recent weeks, two cyberespionage groups that the firm linked to Beijing’s military and intelligence agencies have launched a variety of attacks against South Korea’s government, military, defense companies and a big conglomerate, John Hultquist, director of cyberespionage analysis at FireEye Inc., said in an interview. The California-based firm, which counts South Korean agencies as clients, including one that oversees internet security, wouldn’t name the targets. While FireEye and other cybersecurity experts say Chinese hackers have long targeted South Korea, they note a rise in the number and intensity of attacks in the weeks since South Korea said it would deploy Terminal High-Altitude Area Defense, or Thaad, a sophisticated missile-defense system aimed at defending South Korea from a North Korean missile threat. China opposes Thaad, saying its radar system can reach deep into its own territory and compromise its security. 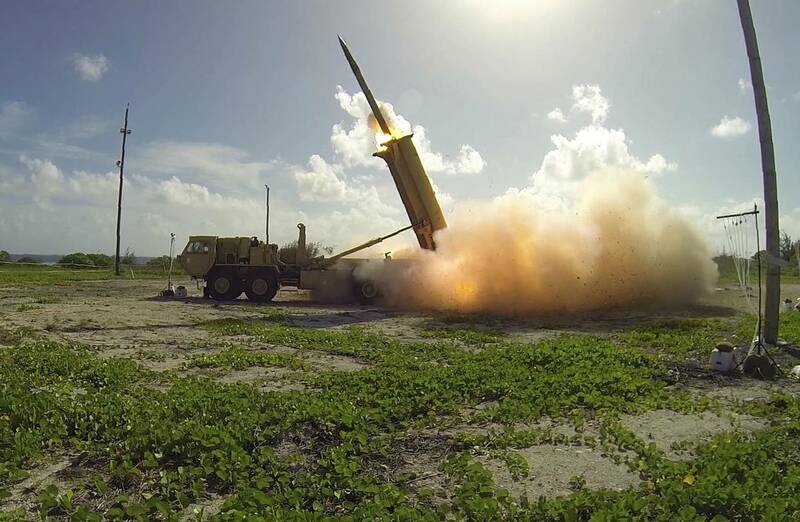 South Korea and the U.S. say Thaad is purely defensive. The first components of the system arrived in South Korea last month and have been a key issue in the current presidential campaign there. ** Mother of All Bombs A journey to the Afghan village where President Trump dropped the biggest bomb. ACHIN, AFGHANISTAN — I spent the evening of April 13 with a cousin and two aunts in the upscale Wazir Akbar Khan neighborhood in Kabul, Afghanistan. My aunts mostly talked about their relaxed, liberal early youth in the 1960s among the Kabul elite. As we waited in the driveway for our car, my cousin told me about an explosion in Nangarhar, the eastern province of Afghanistan, where our family comes from. We scrolled through our phones. As we drove out, it became clear it wasn’t the beginning of the Taliban’s so-called Spring Offensive. Around 8 p.m. Afghan time, the United States had dropped a 21,600-pound, $16 million bomb on Asadkhel, a tiny village nestled between two forested hills, to attack a decades-old tunnel system that was being used by fighters claiming allegiance to the Iraq- and Syria-based Islamic State. Afghanistan has been at war for almost four decades now. Our people lived through the Soviet occupation and the war the mujahedeen fought against the Soviets with the support of the United States; freedom from the Soviet occupation was stained by a brutal civil war between mujahedeen factions (warlords had ruled large parts of the country and exacted a terrible human cost). The Taliban rule followed. We watched them being bombed into submission and escape after Sept. 11, celebrated a few years of relative calm, and saw the Taliban return to strength and wage a long, bloody insurgency that continues to this day. We watched the world tire of our forever war and forget us. With spring, yet more turmoil has come to significant parts of Indian-controlled Jammu and Kashmir. Widespread violence has resulted in several deaths and has left at least 200 injured. The trigger this time appears to have been elections for two vacant seats in the Indian Parliament. One seat, in the capital city of Srinagar, had been vacated after its holder, Tariq Hameed Karra, quit the Peoples Democratic Party in a dispute over the handling of political disturbances in the state last year. The other seat had been empty since the current chief minister, Mehbooba Mufti, left it last year to assume her present role after the death of her father, the veteran Kashmiri politician Mufti Mohammad Sayeed. As the April 2017 elections approached, various separatist organizations in the state, including the umbrella organization, the All Party Hurriyat Conference, called for a boycott. This was nothing new, and on previous occasions, most Kashmiris ignored the instructions and turned out to the polls in substantial numbers. This time, however, even the capital city, Srinagar, saw a precipitous decline in voter turnout. A mere 7.14 percent of the eligible electorate turned up to the polls during the first week of April—the worst showing in three decades. Violence was so widespread in the other constituency, Anantnag, that one of the candidates asked the election commission to postpone the election until late May, which it did. With the help of ISRO, the central government may rid the MGNREGA of its most well known characteristic—corruption. In a move that would substantially increase the accountability and transparency of National Rural Employment Guarantee Scheme, the Ministry of Rural Development (MoRD) in collaboration with Indian Space Research Organisation’s (ISRO) National Remote Sensing Centre has successfully geo-tagged and publicly listed 10 million assets. Based on a Memorandum of Understanding (MoU) signed between the Department of Rural Development, the MoRD, New Delhi and National Remote Sensing Centre (NRSC), ISRO, Hyderabad, in June last year, the NRSC had been entrusted with the task of developing the geo-spatial solutions on the Bhuvan Geo-portal and also the mobile based geo-tagging applications for the Mahatma Gandhi National Rural Employment Guarantee Act (MGNREGA) scheme. An on-going process, geo-tagging not only facilitates online recording and monitoring of assets to check leakages but also serves as a tool for effective mapping of terrain for future developmental works. Geo-tagging implies that the assets created under MGNREGA, which include those of farming and agricultural facilities like canals, dams, irrigation and sanitation projects, are identified via satellite technology. This ensures credible verification and effective dealing with the complaints of non-durability of such assets. Geo-tagging involves capturing the latitude and longitude of the said asset with pictures which are then made visible on the government-owned mapping platform Bhuvan. This, in turn, provides 2D and 3D maps, and other geo-spatial applications. What exactly were the Panama papers, what did they reveal, and who all were named in it? The Supreme Court of Pakistan ruled on Thursday that there was insufficient evidence to order the removal of Prime Minister Nawaz Sharif from his post but ordered the formation of a Joint Investigation Team (JIT) to probe the case that has its origins in what are called the ‘Panama papers’. Petitioners, based on the revelations of the Panama papers last year, had alleged that the Sharif family held illegal assets in London and sought the ouster of the Prime Minister because they alleged he was involved in corruption and was no more "honest" and "truthful" as is required by the Pakistani Constitution. The Panama papers are a set of 11.5 million leaked documents belonging to a Panamanian law firm and corporate service provider, and the world’s fourth-biggest offshore law firm, Mossack Fonseca. Obtained from an anonymous source by the German Newspaper Süddeutsche Zeitung, and shared with the International Consortium of Investigative Journalists(ICIJ), the documents shocked the world as they revealed ways in which the rich and powerful make use of secretive offshore tax regimes. The Taliban launched a suicide assault on an Afghan Army corps headquarters in the northern province of Balkh today and attacked the mosque on the base. 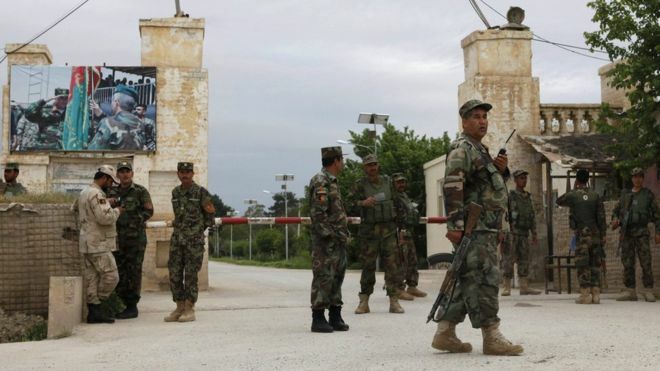 Taliban fighters “managed to penetrate multiple layers of protection at the Afghan National Army’s 209 Shaheen Corps Headquarters” near the provincial capital of Mazar-i-Sharif, TOLONews reported. The Taliban fighters reportedly entered the base in two Ranger pickup trucks, which are used by Afghan security forces and supplied by the US. The Taliban fighters were wearing Afghan military uniforms, according to Pajhwok Afghan News. The Taliban assault team is said to have attacked the mosque on the base. At least 10 people are reported to have been killed in the fighting. It is unclear if the casualties include Taliban fighters. Taliban spokesman Zabihullah Mujahid claimed the attack on his Twitter feed, and said the Taliban opened the assault by using “suicide attacks,” which allowed “a large number of Mujahideen” to penetrate the base. According to Mujahid, more than 100 Afghan security personnel were killed in the fighting, including a battalion commander known as Shirin Agha and Colonel Abdul, “the Chief of Staff Corps.” His account could not be verified, and the Taliban routinely inflate the number of casualties caused by their operations. Insurgents targeted those leaving Friday prayers at the base's mosque and others in a canteen, the army said. The Taliban said in a statement they had carried out the attack, using suicide bombers to breach defences. Earlier estimates put the death toll as high as 134, but a statement from the defence ministry on Saturday gave the figure of more than 100 killed or injured. It is one of the deadliest tolls in a Taliban attack on the Afghan army. At least 10 Taliban militants were also killed in the fighting and one attacker was detained. The Afghan government has declared Sunday a day of national mourning. 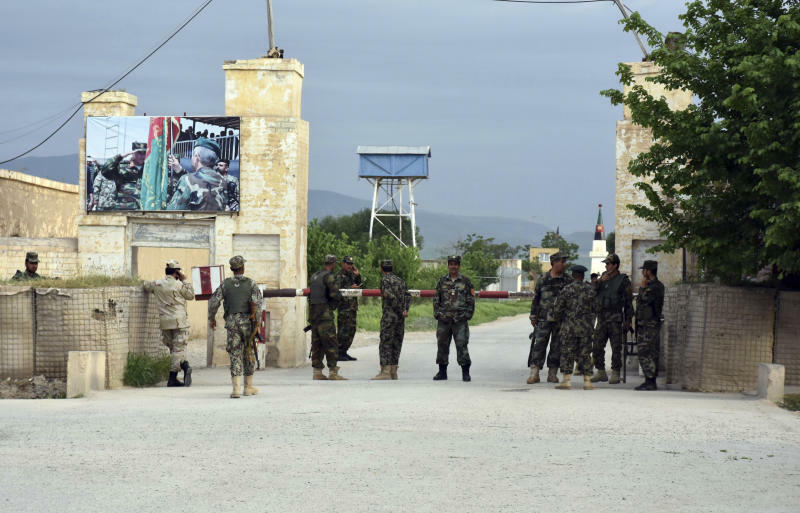 MAZAR-I-SHARIF/KABUL, Afghanistan (Reuters) - President Ashraf Ghani declared a national day of mourning after scores of soldiers were killed by Taliban fighters disguised as fellow soldiers, in the deadliest attack of its kind on an Afghan military base. The defense ministry has said more than 100 died or were injured in the Friday attack in the northern city of Mazar-i-Sharif, but no exact numbers have been released. One official, speaking on condition of anonymity, told Reuters at least 140 soldiers were killed and many others wounded. Other officials said the toll was likely to be even higher. The attack starkly highlighted the difficulty of the long struggle by the Afghan government and its international backers to defeat the Taliban insurgency. After arriving in Mazar-i-Sharif to visit the base on Saturday, Ghani ordered that flags be flown at half mast on Sunday in memory of the troops who died. We should not panic, any more than we panicked when Russia and China acquired similar capabilities many decades ago. In those cases, we relied on deterrence to prevent an attack, while, in the case of the Soviet Union, implementing a containment doctrine premised on the assumption that the dysfunctional Soviet state would eventually collapse. That strategy was amply vindicated by the peaceful end of the Cold War and could usefully be followed in the case of North Korea today. 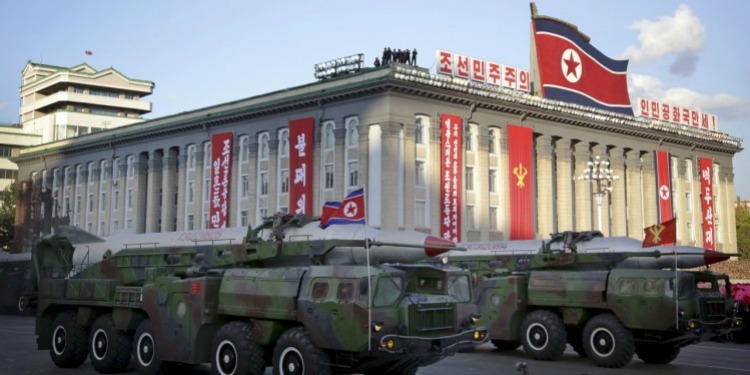 From the U.S. perspective, our policy should be to hasten the regime’s demise by applying all possible sanctions, but not to isk an outright military confrontation with a state that possesses nuclear weapons and artillery zeroed in on Seoul. That seems to be the policy that H.R. McMaster, the national security adviser, was hinting at when he said on Sunday that the U.S. should “take action, short of armed conflict, so we can avoid the worst” in dealing with “this unpredictable regime.” If so, then the Trump administration is taking a responsible approach—ratcheting up the pressure but stopping short of war. Let’s hope that this is, in fact, the policy going forward. It is all too easy to talk about military options in general terms. The devil, however, lies in the details—both in terms of the practical ability of a given side's capability to execute given options and in terms of the ability to predict how the other side(s) will react and how the resulting conflict will escalate or be terminated. This is particularly true in the case of North Korea. Its leader maintains power and control by constantly exaggerating the threats his country faces, provoking outside states like the United States and South Korea, and leveraging China's need for his country to be a strategic buffer on its northern border, against China's desire for stability and economic development. He gains from carefully exploiting what other states tend to see as extremism, overreaction, and "irrational action." This offers him a way of dealing with the reality that North Korea is economically weak and is a large but often obsolescent military power. While estimates differ, the CIA World Factbook offers some of the highest public estimates of North Korean GDP. Recent CIA estimates indicate that North Korea's population is around 25.2 million versus 50.9 million for South Korea, making it roughly half the size of its southern neighbor. The CIA notes that any estimate of North Korea's GDP presents major problems, but reports that North Korea's GDP is somewhere around $40 billion in purchasing power parity terms versus over $1.9 trillion for South Korea, or a little over 2% of the size of its neighbor's economy. Sino-Indian relations have entered uncharted territory as New Delhi seeks to engage Beijing strictly on reciprocity. As Prime Minister Narendra Modi consolidates his power over the Indian political landscape, his government should not lose sight of the fact that China poses the most significant strategic challenge to India. India and China continue to be at loggerheads on a range of bilateral issues, as China shows no signs of budging on key issues that matter to India. Indian Foreign Secretary S. Jaishankar visited Beijing recently for the China-India Strategic Dialogue but nothing much came out of it. Though Jaishankar suggested that he came with “a very strong sense of commitment to maintaining our relationship” and China’s top diplomat, State Councillor Yang Jiechi, underlined that he believed relations had seen “positive growth” in 2016, it was evident at the end of the dialogue that the two sides have failed in bridging their fundamental differences. There was no change in Beijing’s stance on blocking efforts to get Pakistan-based militant Maulana Masood Azhar listed as a terrorist under UN norms as well as its opposition to India gaining entry to the Nuclear Suppliers Group. New Delhi has also been left asking Beijing to explain how it can take part in the Silk Road summit being held in China when the $46 billion China-Pakistan Economic Corridor passing through PoK violates India’s sovereignty. And rather provocatively, Dai Bingguo, who served as China’s boundary negotiator with India from 2003 to 2013, recently suggested that the border dispute between China and India can be resolved if New Delhi accepts Beijing’s claim over the strategically vital Tawang region in Arunachal Pradesh. This was done knowing fully well that India would never agree to such a proposition and without specifying what concessions Beijing would be willing to make. The battle in Arunachal is not just between two sovereign states, but also between two ideas and cultures. Does India have its own house in order to fight this one? The recent renaming of six towns in Arunachal Pradesh by China, in Mandarin, has shown the world that it has always been Han racism which has been the animating force of the Maoist-Marxist regime. The Chinese call this exercise ‘standardizing’ of the names. At one level this is both propaganda war and staking of claims against India in Arunachal Pradesh. At another level, it is the denial of the cultural identity of Tibet, which has been the official policy of China. The sustained genocide and cultural cleansing of Tibetans by the Chinese is now being illegitimately extended to Arunachal Pradesh. The renaming of the towns in Mandarin is part of the decades long Sinicizing exercise, which has been justified by ideologues of the Maoist doctrine. Dan Smyer Yu, anthropologist from the Yunnan Minzu University points out in his work on Tibetan Buddhism, that in the context of China, the Maoist-Marxist evolutionary paradigm reinforced the traditional Han Chinese prejudice of the non-Han populations being savage and barbarian. The decade and a half the United States has spent fighting the "long war" in the Middle East has yielded many tactical successes but left a lasting victory elusive. The inconclusive nature of these struggles has sapped support for the U.S. policy of shouldering the burden of providing security and stability in the region. Although many believe U.S. involvement in the region has resulted in more violence, disorder, and radicalization of local Arab populations, the current situation in the Middle East illustrates that inaction has been highly destabilizing. In this new CSBA report, Eric Edelman and Whitney McNamara expand upon the histories, cultures, and foreign policies that have brought the United States to its current juncture in the Middle East. This is the last of four reports that provide detailed regional recommendations based upon the defense strategy outlined in Andrew F. Krepinevich's Preserving the Balance: A U.S. Eurasia Defense Strategy. Despite the growing importance of different regional theaters in which the United States must operate, it seems almost certain that the dual challenges of Iran's regional rise and the persistent threat of violent jihadists will continue to demand the time, attention, and resources of national security decision-makers. The Middle East presents an enormous set of difficulties for policymakers against a backdrop of long-lived conflict and turmoil that is likely to persist for a generation - or perhaps longer. The United States has historically been successful in accomplishing its strategic objectives in the region, and it can be again if it develops a clear strategy that aligns ways, means, and ends and builds up capable partners in the region to contain Iran's ambitions and defeat violent jihadists. Without such a strategy, both challenges will otherwise threaten the governments of America and its partners. One of the greatest parts about attending Inform[ED] was being introduced to the different perspectives and aspects that go into cybersecurity. You realize very quickly how cybersecurity isn’t as simple as firewalls and computer viruses, but is truly an ongoing evolutionary battle between cybercriminals and security entities that are fighting to get one step ahead of the other. One of the panel speakers I was fortunate to interview was Brian Rexroad, Vice President of security platforms at AT&T. Mr. Rexroad took some time and offered his insight on the techniques cybersecurity firms use to detect impending or active threats, how they manage around “gray areas” involving customer privacy, and more. WDD: From your experiences, what (if any) are some for the early recognizable signs of an attempted or impending large-scale network attack (think Mirai, Ukraine, Finland incidents)? Rexroad: The early indications we try to pick up on for something like Mirai (which propagates by scanning for targetable devices), involve trying to find in the flow activity of the network—characteristics that point to devices scanning the Internet for vulnerabilities. We’ll try to determine if the reasons another device is scanning an Internet network are legitimate, since there are multiple companies that scan for security, consumer, and other service-related purposes. Statistically speaking, when you start to see increases in a number of sources that are doing scanning with particular patterns, it’s probably an indication that a botnet is building up. So that’s what we try to look for, which is a network-level indicator. For most of its history, the United States' seat at the forefront of innovation has gone unrivaled. Thanks to its natural geographic strength, ample access to capital, top-tier education and expansive government-funded research, the nation has pushed the boundaries of science like no other. But as any bodybuilder will tell you, true strength requires upkeep. And the proposed budget cuts of the newest U.S. administration have many American scientists — and Washington's foreign rivals — questioning whether the United States is about to lose its competitive edge. This note provides highlights from a one-day CSIS workshop held March 22, 2017, with government, industry, financial, and policy experts exploring the role of U.S. tight oil production in the global energy landscape. The workshop addressed a limited set of key issues concerning the role of U.S. oil in the global markets and is being followed by two related CSIS workshops dealing with societal and environmental risks in U.S. onshore development and the global natural gas markets. Background: The rapid rise in unconventional oil output in the early part of this decade returned the United States to a prominent position as a major oil supplier. Over the course of the past 10 years, U.S. liquid production has risen by over 150 percent as net import dependence has fallen by over 60 percent. The United States is now the world’s largest exporter of refined petroleum products and in 2016/2017 became a net exporter of natural gas. The resource endowment coupled with the success of quick cycle development of light tight oil (LTO) continues to affect global oil markets. What is the state of play in global oil markets? What is the status of U.S. onshore production? What role does U.S. onshore production play in the market? After two years of a low-price environment, a potentially bumpy market rebalance is underway. Palantir Technologies, the Silicon Valley data company co-founded by billionaire investor Peter Thiel, has developed an almost mythical reputation for its work building tools for the U.S. intelligence community. But Palantir has had a far rockier relationship with the nation’s top spy agencies than its image would let on, BuzzFeed News has learned. As of summer 2015, the Central Intelligence Agency, a signature client, was “recalcitrant” and didn’t “like us,” while Palantir’s relationship with the National Security Agency had ended, Palantir CEO Alex Karp told staff in an internal video that was obtained by BuzzFeed News. The private remarks, made during a staff meeting, are at odds with a carefully crafted public image that has helped Palantir secure a $20 billion valuation and win business from a long list of corporations, nonprofits, and governments around the world. At the height of the “Afghan Surge” in 2010-2011, more than 100,000 U.S. and coalition troops were committed to a counterinsurgency (COIN) mission of “clear, hold, and build” on behalf of the Government of the Islamic Republic of Afghanistan (GIRoA): Clear the countryside of insurgent fighters. Hold the terrain, alongside Afghan security forces. Build infrastructure, commerce, and rule-of-law. As part of this wave, the 2nd Brigade Combat Team, 34th Infantry “Red Bull” Division (2-34th BCT) deployed more than 3,000 citizen-soldiers to Eastern Afghanistan. It was the largest call-up of Iowa troops since World War II—and one of the only times a U.S. National Guard brigade was designated as a “battlespace owner” during Operation Enduring Freedom. Others include Vermont’s 86th Infantry Brigade Combat Team, “Task Force Wolverine,” 2009-2010; and Oklahoma’s 45th Infantry Brigade Combat Team, “Task Force Thunderbird,” 2010-2011. As it was fielded during this time period, an Army brigade combat team was the smallest combined arms unit capable of conducting and sustaining independent operations. Tasked with a full-spectrum mission, one involving clear, hold, and build lines of effort within a multi-provincial area of responsibility, a brigade combat team engages within the operational threshold—the level at which the tactical rubber meets the strategic road. As such, it presents an ideal scale at which to collect and consider concrete lessons regarding counterinsurgency efforts. Amid fears of Russian hackers increasing their rate of cyberattacks, the head of the German military’s new cyber command revealed that military computers have been hit with nearly 300,000 attacks so far this year, reports International Business Times. Lt. Gen. Ludwig Leinhos, head of the new cyber command, did not offer details on the type of cyberattacks that targeted the sensitive computers, but the German military indicated that classified material was not compromised. To address the increasing threat, the new cyber command is rapidly expanding. The team will be initially comprised of 250 personnel, but is expected to grow to 13,500 personnel by mid-2017 and reach a total force number of 14,500 by 2021. “The expansion of cyber capabilities is an essential contribution to the government’s overall security posture,” a military spokesperson said in a statement. Multiple alleged cyberattacks by Russian hackers that have targeted election campaigns, politicians and government institutions have left world leaders reeling. Fancy Bear, a known hacking group, is responsible for at least two major attempted cyberattacks against Germany. One of the attacks, which occurred in 2016, targeted political parties with emails designed to look like they came from NATO. After years of sitting on piles of cash, Indian information technology (IT) services firms are suddenly dispensing some of it to their shareholders by way of buybacks. In mid-February, Tata Consultancy Services (TCS), India’s largest IT services firm, which has a cash pile of around Rs.40,000 crore ($6 billion), announced that it would buy back equity shares worth up to Rs.16,000 crore ($2.4 billion). This is TCS’ first buyback scheme since it went public 13 years ago and also the biggest share repurchase program in the country. (A few weeks before TCS’ announcement, Nasdaq-listed Cognizant Technology Solutions, which has the bulk of its workforce in India, declared a dividend payout and a share buyback of $3.4 billion.) In March, HCL Technologies said it would buy back Rs.3,500 crore ($340 million) of shares. Others like Wipro and Tech Mahindra are expected to follow suit. On April 13, announcing its results for the fourth quarter of fiscal 2017, Infosys said that up to Rs. 13,000 crore ($2 billion) is expected to be paid out to shareholders during 2018 in dividends, share buybacks or both. In addition, the company expects to pay out up to 70% of free cash flow next year in the same combination. Currently, Infosys pays out up to 50% of post-tax profits in dividends. The buybacks are a move to boost share price and soothe investor sentiments. They are also designed to make them less attractive to predators. After years of giving high returns, the industry has been delivering below expectations; most Indian IT services firms have been performing below the Sensex, the benchmark stock index. Recent developments like U.S. President Donald Trump’s election and the ensuing controversy surrounding outsourcing and H1-B visas, and technology disruptions caused by digital transformation and automation are in fact threatening the very fundamentals of the $108 billion IT-BPO exports industry. That industry put India on the world map because of its high-quality, low-cost tech talent and a successfully executed offshore-global delivery model. (Indian IT firms use the H-1B temporary work visas in large numbers to fly their engineers to client sites in the U.S., which is their largest market accounting for over 60% of exports.) 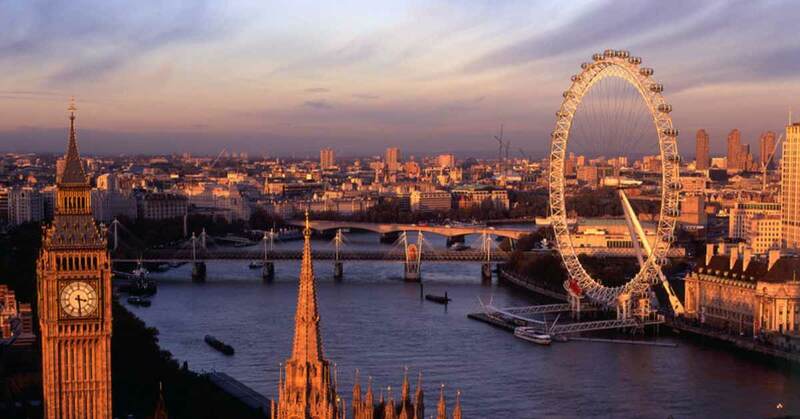 There are also pressures from other quarters, such as Brexit and the consequent delays in decision making; slowdowns in the banking and financial services sector, and reduced discretionary IT spending. “In war, the truth is so precious that is has to be surrounded by a bodyguard of lies" -- Winston Churchill speaking at the end of WWII. In recent days, there has been a lot of speculation on the Internet -- and even among the mainstream media -- over the true cause of the many failures of North Korea’s missile tests. Some people are suggesting the Trump Administration is behind the failures by somehow introducing a virus into the missile systems to make them fail. Such freelance analysis on the Internet is unhelpful in the least. It sets hares running. It makes potential enemies more aware of their vulnerabilities, and often closes off avenues that might otherwise have been helpful. In an era where nothing seems to be a secret anymore, a frenzy of on-line speculation over the range and potential of American cyber-attack capabilities really does not help. Even if such so-called analysis is intended to create false news stories to bury the original secret is a mountain of lies, it still remains dangerous. People who do this are messing with the very foundations of the security of the United States.